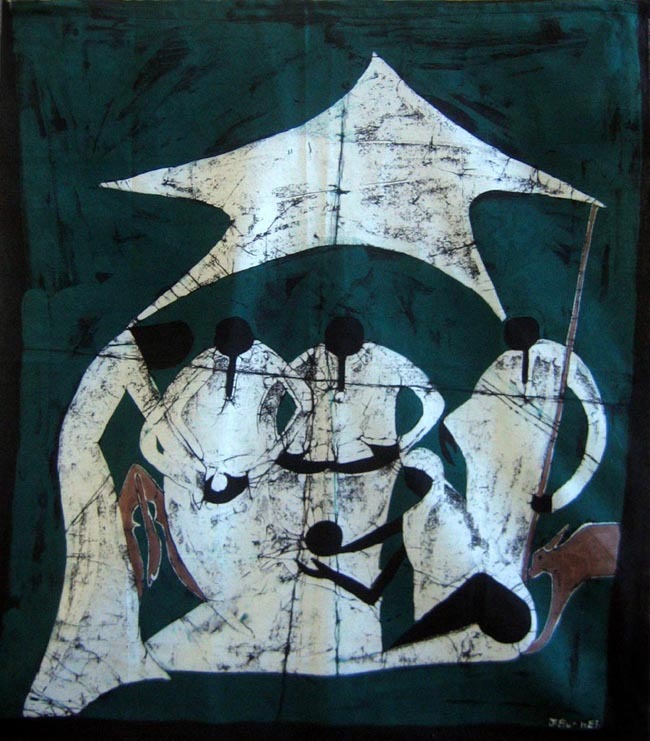 This batik Nativity hanging from Guinea was made by James Bucher, a Guinean painter living and working on the African continent. James is known in Guinea for his colorful and creative pieces. The painting is signed. The cloth measures 23 inches by 34 inches. Because of recent political and economic crises in Guinea, James Bucher sent me a handful of his batiks to sell. Guinea is the 156th out of 177 poorest countries in the world. Inflation rates have tripled in Guinea in the last two years, which makes it extremely difficult for the population, especially upcoming artists, to survive on less than one dollar a day. Purchasing this batik allows James to pay for his daily living expenses as well as a 6-month lapse in his rent. This money will also allow him to pay for more art products to sell throughout Western Africa and eventually the United States.